Inspired by pro-democracy protests in Egypt and Tunisia, youth activists in Azerbaijan took to the streets in actions encouraged and coordinated by social media . Although small in comparison to similar events in the Middle East and North Africa, it was enough concern for the authorities in the oil-rich former Soviet republic to attempt to discredit social networking sites such as Facebook as well as detain those who might be using them  ahead of today's actions. However, writing on The World Affairs Blog Network, Karl Rahder was unsure how many would turn out . The organizers sent out more than 35,000 invitations for people to support the event, but as of the early hours of 8 March (Azerbaijan time), only 3200 or so had clicked the “I’m Attending” button, with 5,577 saying they would not attend. That sounds like much ado about very little, but we shall see. Nevertheless, with the amount of online support far higher than that in neighboring Armenia  for a demonstration which amassed over 10,000 in the physical world, the authorities in Baku seemed to be taking the protests seriously enough, alleging that it had actually been ‘orchestrated by hostile countries,’ something that few believe . 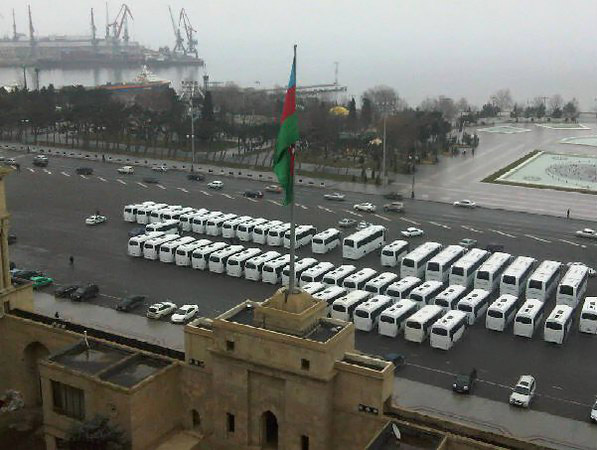 One Azerbaijani posted a photograph of dozens of police vehicles parked in Baku's Freedom Square illustrating that the government wasn't leaving anything to chance, while another contemplated the day on the eve of the protest itself. Arguably the most Internet-savvy activists in the region, with networks also extending to Azerbaijanis living outside the country, Twitter was also used relatively extensively leading up to the protests as well as on the day itself. Indeed, there had also been attempts to hijack the #11mart hashtag for the protests although that was less evident as the day wore on. Interestingly, most of the tweets from the youth activists were in English while government supporters preferred to write mainly in Azerbaijani. Regardless, to begin with at least, most of the activists’ tweets detailed numerous arrests. Eventually, however, more descriptive tweets started to appear along with reports of disruptions to public transportation and commentary on official explanations as to why. On the same day as an earthquake and tsunami in Japan there were also some poignant tweets from one young Azerbaijani living outside the country. As the early evening approached, tweets once again returned to the subject of those detained and why. According to news reports and other information spread via Twitter, 43 people had been detained  by the time the protests died down of which 20 were taken to court and 23 released . Nevertheless, activists and supporters appeared in buoyant mood despite concerns over others unaccounted for. In particular, a photograph by Abbas Atilay, who was also reportedly assaulted by police, was widely shared and commented on. At time of writing there is still activity on Twitter updating followers on the status of those taken to count. Tweets seem to indicate that most are being sentenced to 6-7 days imprisonment  as activists await planned demonstrations by opposition parties tomorrow . 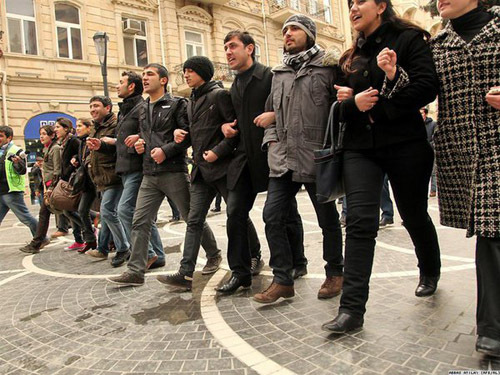 Whatever happens then, however, today's protest represented the largest youth action Azerbaijan has seen since the 10 May 2009 Flower Day protests .